Have your gastroenterology procedure close to your North Shore home. North Shore Medical Center (NSMC) gastroenterology physicians provide gastroenterology treatment for pancreatic, bowel and liver and other gastrointestinal conditions. North Shore patients in need of a gastroenterology procedure receive exceptional care at NSMC, the same great care that a gastroenterology Boston specialist would provide, but at convenient locations. Gastrointestinal bleeding, which may be a symptom of hemorrhoids, peptic ulcers, diverticulosis and diverticulitis, colonic polyps or cancer in the colon, stomach or esophagus. Diverticulitis - the inflammation of small sacs in the inner lining of the intestine. Acid reflux (GERD), where the lower esophageal sphincter doesn't close properly, allowing acid produced by the stomach to move up into the esophagus. Gallstones, where a duct is blocked by small stones in the gallbladder. Acute and chronic liver conditions such as cirrhosis, fibrosis, hepatitis, jaundice and other conditions. Crohn's disease, an inflammatory disease of the gastrointestinal tract. 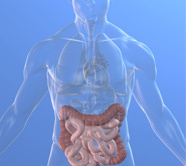 Colitis, a swelling or inflammation of the large intestine. Pancreatic and biliary diseases, including pancreatitis, cystic fibrosis, cysts, cholecystitis and other conditions. Diarrheal diseases, including bacterial, viral and parasitic diseases. Inflammatory bowel disease and diverticulitis. Acupuncture: an alternative procedure for gastroenterology patients. Some gastroenterology patients may benefit from acupuncture treatment to help prevent the pain of certain diseases. Acupuncture acts on the sympathetic nervous system and stimulates the body to produce biochemical substances that can alleviate pain. Acupuncture helps to restore the general balance the entire body system and has been helpful in the treatment of colitis, irritable bowel syndrome, constipation, spastic colon, diarrhea, ulcers, gastritis, hemorrhoids and other gastroenterology conditions. Patients may also benefit from individual nutritional counseling, where a skilled registered dietitian works to improve overall nutrition and reduce the symptoms of gastroenterology diseases. Nutrition counseling is also an important component of a diabetes treatment plan. Find a surgeon for a gastroenterology procedure. Also use our Find a Doctor search to find a specific clinical specialist, such as a pediatric rheumatologist or a specialist in treatments for hyperhidrosis, or to find physicians in specific locations, such as Salem orthopedic surgeons.